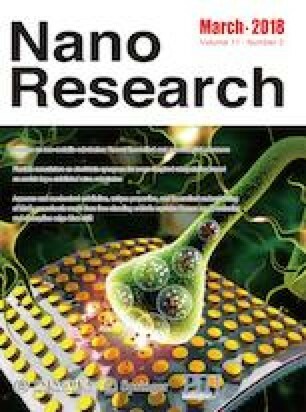 Nickel-iron layered double hydroxide (NiFe-LDH) nanosheets have shown optimal oxygen evolution reaction (OER) performance; however, the role of the intercalated ions in the OER activity remains unclear. In this work, we show that the activity of the NiFe-LDHs can be tailored by the intercalated anions with different redox potentials. The intercalation of anions with low redox potential (high reducing ability), such as hypophosphites, leads to NiFe-LDHs with low OER overpotential of 240 mV and a small Tafel slope of 36.9 mV/dec, whereas NiFe-LDHs intercalated with anions of high redox potential (low reducing ability), such as fluorion, show a high overpotential of 370 mV and a Tafel slope of 80.8 mV/dec. The OER activity shows a surprising linear correlation with the standard redox potential. Density functional theory calculations and X-ray photoelectron spectroscopy analysis indicate that the intercalated anions alter the electronic structure of metal atoms which exposed at the surface. 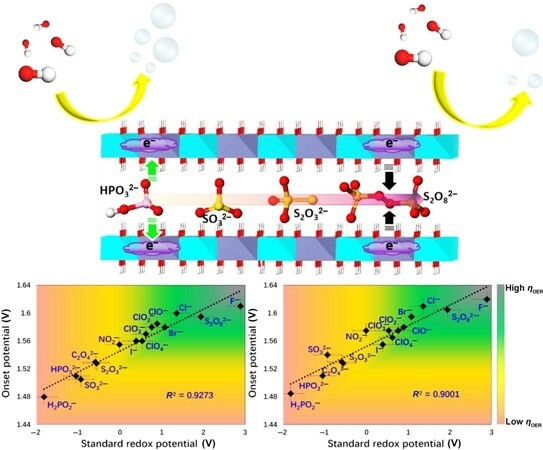 Anions with low standard redox potential and strong reducing ability transfer more electrons to the hydroxide layers. This increases the electron density of the surface metal sites and stabilizes their high-valence states, whose formation is known as the critical step prior to the OER process. Supplementary material (preparation methods, characterization details, polarization curves, electric double layer capacitance measurements, potentiostatic stability testing, XPS, lattice parameters ) is available in the online version of this article at https://doi.org/10.1007/s12274-017-1750-9. This work was supported by the National Natural Science Foundation of China (NSFC), the National Key Research and Development Project (Nos. 2016YFF0204402 and 2016YFC0801302), the Program for Changjiang Scholars, and innovative Research Team in the University, and the Fundamental Research Funds for the Central Universities, and the long term subsidy mechanism from the Ministry of Finance and the Ministry of Education of China. S.S. gratefully acknowledges Villum Foundation.